Just wishing everyone one an excellent New Year and a prosperous twelve months ahead. Lets all make this next year one to remember! Today I have two amazing pieces of news. Firstly almost all of our membership options have dropped in price. Now our standard 30 day membership is an incredible US$17.95 (UK£9.95). Even our 60 day membership is just US$29.95. That’s excellent value for full instant access to the entire website. Secondly, you can now purchase memberships using Bitcoin. If you want a truly anonymous way to purchase your membership, this option will appeal to you. Currently there is only one membership option available via Bitcoin, but if this proves to be popular, we will add more soon. This is our most exciting billing option addition in years and I’m particularly keen to hear what people think about it. To see our new Bitcoin option click here. Our hypnosis videos have been extremely popular, but unfortunately due to recent changes in content regulations they are no longer allowed. 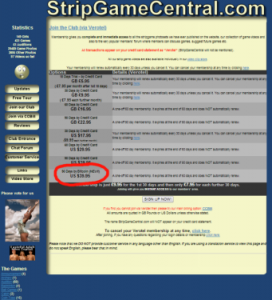 Consequently we have been required to remove them all from the StripGameCentral.com members’ area immediately. To maintain our credit card facility we must comply with the new regulations and sadly have no option to appeal. Infringing the rules would case the immediate closure of this site and its club area. This would obviously be catastrophic both for us and our loyal members so we cannot take this risk. Sorry for any inconvenience this has caused. The situation is completely outside our control.